La Fuente Vieja - the Old Well - on the western slope of the cabezo El Conquero, almost in line with the Calle Menendez Pelayo in the Las Colonias quarter of Huelva, was already known for centuries. Because of the 25th anniversary of the Municipal Water Works a multidisciplinary study was made by historians, geographers, speleologists and archaeologists into the history and special circumstances of this infiltration gallery annex well. The city of Huelva is situated on a peninsula in the estuary of the rivers Rio Tinto and Rio Odiel. 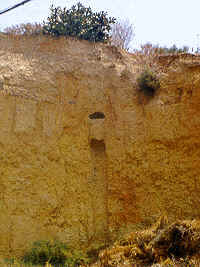 Apart from the sedimentary deposits the major factor that has determined the urban development of Huelva are the so-called cabezos or hillocks, elevations to a maximum of 60m high shaped by sand and slime of sedimentary origin (tertiary period with a compact quarterny cover). Such a hillock can act as a sponge absorbing the water that is filtered through the semi-permeable superior layers until it comes upon the impermeable blue marls. A well above this layer will give ample water. 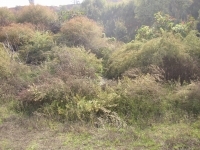 The cabezo / hillock of El Conquero is close to the city centre, so during many years the Fuente Vieja gave water to the Huelvians. Little is known about the water supply in the Tartessus period (2000 - 500 bc) because of lack of archaeological findings. 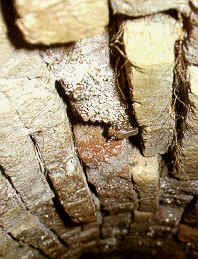 In Roman times Huelva - or Onuba as in classical texts - was of some importance partly based on industrial activities as the mining of minerals in the region. The processing of fish with salting basins in Huelva required much water. Two lead pipes have been found the Palos street which confirms the presumption that in roman times there was already a water supply system in Huelva-Onuba. referring to Huelva's water supply "formed by arcades of wide openings through high mountains". But this citation was never mentioned in any later text so it seems more probable that the author made reference to the vaulted shape of the gallery and its dimensions wider than the habitual water pipes. 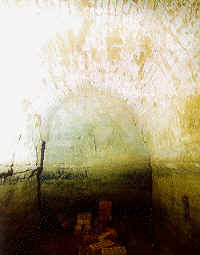 Rodrigo Caro wrote in 1634: "... there is a Hermitage at a quarter of a league from the place that is called Our Lady of Cinta, where there is a very devout and miraculous image, and close to it there is an old aqueduct that supplies very good and abundant water to the town under the ground". So the existence of an underground pipe or channel in the area of the La Cinta sanctuary in the NW part of the hillock was known since centuries but the references to the La Fuente Vieja start in the middle of the 17th century in some town council acts. Three elements of the Fuente Vieja have been observed in the recent study: the well annex settling basin, the water collecting gallery and some manholes. 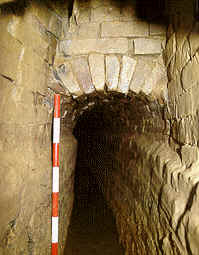 The dimensions of the underground basin of the well were 2,50 x 1,80m and 2,40m high, made of medium-sized sandstone blocks joint without mortar, with different lines of calcareous concretions, the strongest 1,1m from the bottom. Clearly several modifications have been made over time. Only this basin has been found although a working man who maintained the system in the 20's has testified of a second basin of similar dimensions near the present TV-relay station on El Conquero. The gallery and its flowing water are oriented from North to South. After carefully cleaning a 14m long N oriented section was made available; the S-oriented part is 125m long, both with dimensions of 0,40m wide and 1,25m high, with walls made of very uniform blocks of 30 x 22 x 7 cm. Two systems of roofs were applied: flat ones of slate sandstone - only applied 0,80m to the N and 2,9m to the S - the rest is vaulted with an inside radius of 27 cm and made of bricks. The walls were partly covered by calcareous concretion, 90 cm high and 2 cm thick. During the cleaning-up of the gallery two manholes were discovered at 25 and 78m from the Fuente Vieja. Both were very similar, rectangular shaped: 0,45 x 0,70m and made of bricks like the ones used in the gallery. Both were silted by debris and at the surface no openings have been found until now. At 128m from the Fuente Vieja another vent was found at the surface although in this case the opening was not made directly from the ground: the access was made through a small tunnel 8m long with a very sharp ramp. 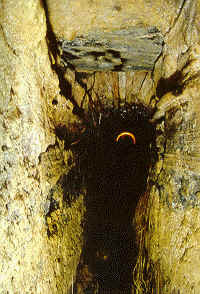 At the end the original vent, 0,6m in diameter, was found. Nowadays this vent is silted but it is known from the working men's testimony that in the first decades of the 20th century it was accessible. An other silted vent can be observed in the Aragon street near the lots 8 - 14 in the cabezo of San Pedro, 850m from La Fuente Vieja. 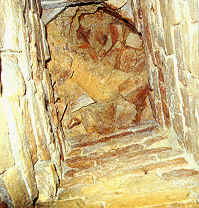 According to the researchers Carmen Garcia Sanz and Pilar Rufete Tomico of the Archaeological Department of the Diputacion de Huelva, La Fuente Vieja and its gallery were part of a more extended system with one of the starting points under the sanctuary of the Lady of the Cinta, probably with a few arteries, under the cabezo / hillock El Conquero to supply water to the city of Huelva. This work was of Roman origin, built - according to thermoluninescence research - at the end of the 1st c AD and mended several times e.g. in the second half of the 11th century. 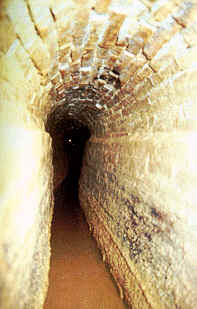 Based on the booklet "La Fuente Vieja, una parte del acueducto romano de Huelva" (La Fuente Vieja, a part of the roman aqueduct of Huelva, 2001) including a 'translation' in English.